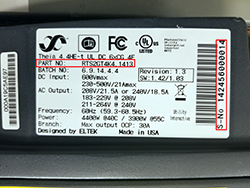 In cooperation with the U.S. Consumer Product Safety Commission, Delta Electronics (USA) Inc. is undertaking a voluntary recall that affects the Eltek Theia He-t String solar inverters. The capacitors on the inverter may fail and result in a heat buildup, posing a risk of fire and an impact hazard if the inverter cover is forcibly ejected from the inverter. If you believe that your inverter is included in this recall, continue reading below to learn about how to participate in the corrective action plan. To view the US CPSC Press Release or our FAQs please click on the menu button at the top of this page. How Do I Know If My Inverter Is Part Of This Recall? If you own the product pictured below, your inverter is included in this recall. The first step to quickly determine if your inverter is potentially included in this recall, is to look at the front display panel of your inverter. If the brand name printed on the front of your display panel reads “Eltek,” and the model designation is “THEIA” and “HE-t, you should immediately stop using these inverters by (1) first turning the disconnect switch on the front cover to the vertical off position, and then (2) switching off the circuit breaker for the unit. Please continue reading below to provide more information about your recalled unit. 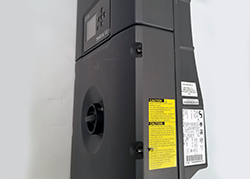 IMPORTANT: Please note if the brand name printed on the front display of your inverter switch does NOT read Eltek, your unit is not included in this recall and you do not need to register. 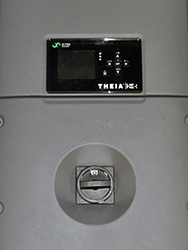 Recalled inverters have a brand name printed on the front of the display panel that reads "Eltek", and the model designation is "THEIA" and "HE-t". You will need your inverter's part number and serial number to complete this registration. The part number and serial number are on the large white label located on the right side of your unit. Please select your Part Number and then enter the Serial Number for the unit using the tool below. You will have the opportunity to enter as many units as you need. If you have a unit with a Part Number that is not listed in the drop down box, then please recheck to make sure that your unit is an Eltek Theia He-t inverter. This is not a valid serial number, please double check your entry. If you feel like you are receiving this message in error please call the number at the bottom of this page. Use the Delete button to remove any units you do not want to register. Please ensure all your units at one address are listed above. If you have units at other locations, you will need to create a separate registration per address. Locate the disconnect switch on the front cover of your inverter, and turn it to the vertical/off position. Then please locate your circuit breaker and turn off the switch for the inverter. I understand that until I receive my new inverter I should stop using my recalled inverter by turning off the inverter switch and circuit breaker. Please provide the name of the person or business that originally installed your inverter. Please provide the address where the inverter(s) are located. Use this field if the purchase was made on behalf of a company. Invalid email address. Acceptable format: 'X@Y.Z'. We will take your information now and arrange for a professional installer to make an appointment with you to remove the recalled inverter from your residence and replace it with a new inverter free of charge. These will be newly manufactured replacement units, and there may be a wait of several weeks before the installer will be able to replace your existing unit. If you need assistance, please contact a representative at 1-888-770-7142 between 7 a.m. and 6 p.m. (Central Time) Monday through Friday.